A water bond measure on the November 2014 general election ballot includes $2.25 billion to fund improvements in Delta ecosystem health and water supply reliability. Photo: State Department of Water Resources, 2007. Ellen Hanak, Co-Director of Research and Senior Fellow at the Public Policy Institute of California (PPIC), testified at a Feb. 26 legislative hearing concerning California’s capacity to incur additional water bond debt. (The Legislature has placed an $11 billion water bond on the November 2014 general election ballot to fund a wide variety of water projects, including water conservation and recycling; groundwater storage, protection and cleanup; and watershed protection and restoration.) Hanak made the following remarks at a joint informational hearing of the Senate committees on Governance and Finance, and Natural Resources and Water Conservation. Thank you for the opportunity to participate in this discussion of water finance issues today. I will focus my remarks on how California can address funding gaps in the water sector, based on recent analyses we have done at PPIC. I’ll begin with an overview of recent water sector funding performance – including water supply, wastewater, flood protection, and ecosystem management – drawing on available information on expenditures and funding needs. Then I’ll provide some thoughts on the potential future roles of different funding sources, including state general obligation (GO) bonds. One of the first things to note is that California’s water sector is quite large – with annual expenditures in the late 2000s averaging around $34 billion. And by far the lion’s share – 86 percent, or nearly $30 billion – is raised and spent by hundreds of local and regional agencies that deliver and treat drinking water, collect and treat wastewater, and manage local flood and stormwater infrastructure. The state’s share is next – 11 percent, or nearly $4 billion. Federal contributions are relatively small – 3 percent, or roughly $1 billion. Local spending comes mainly from local ratepayers. State and federal grants to local agencies totaled just over $1 billion a year. Breaking this information down by area, there are some big differences in scale (Figure 1). Water supply systems account for nearly two-thirds (64 percent) of all water sector spending, followed by wastewater systems (30 percent), floods (5 percent), and ecosystem management by state and federal regulatory agencies responsible for fish and other aquatic wildlife (1 percent). Of course, substantial ecosystem-related spending also occurs as part of the budgets of agencies managing water supply, wastewater, and flood protection, because all of these systems are required to address environmental impacts related to their capital improvements and maintenance work. The two largest parts of the water sector also appear to be in the best shape from a funding adequacy perspective. A comparison of capital spending and estimated capital needs suggests that California’s local water agencies are meeting and even exceeding investment needs (Figure 2). They are able to do this because their system for raising needed funds from local ratepayers is relatively robust. Figure 2. Local water and wastewater investments are generally on track. Hanak et al. 2012. Source: Water and the California Economy. PPIC. 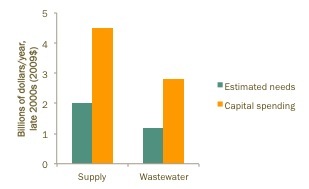 Much bigger problems loom in the smaller areas of the water sector portfolio, however, as Figure 1 shows. Paying for flood protection is a major challenge. The investment needs to provide adequate levels of protection are vast – with over $17 billion in estimated needs in the Central Valley alone – excluding most of the Delta as well as the many other parts of the state that face high flood risk. And the funding system relies on outdated assumptions that California will receive large federal cost shares of 65 percent for investments. Federal funds have long been inadequate to keep pace with spending needs, and these contributions have actually been declining in recent years (Figure 3). The state stepped up to help fill this gap with two bonds authorized in November 2006, committing roughly $5 billion to flood protection. But these funds are nearly all spent. And while there have been some notable recent successes in places like Sacramento and West Sacramento, getting voter approval for local cost shares remains challenging. (Under Proposition 218, approval by at least half of property owners or two-thirds of the general electorate is required to pass or raise local flood assessments). Figure 3. The state has surpassed the federal government in flood investments. Source: Hanak et al. 2011. 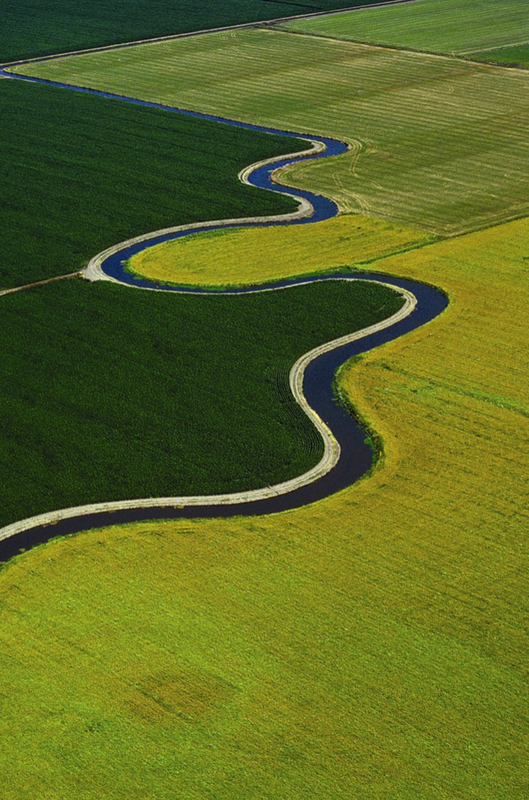 Managing California’s Water: From Conflict to Reconciliation. PPIC. The other major gaps are in the areas of ecosystem management – including the science needed to support smart ecosystem solutions – and the very small but important functions of statewide data, analysis, and planning. Both of these areas have come to rely heavily on state GO bond funds, and the stop-and-go nature of these funds makes it hard to manage activities in a systematic, predictable way. 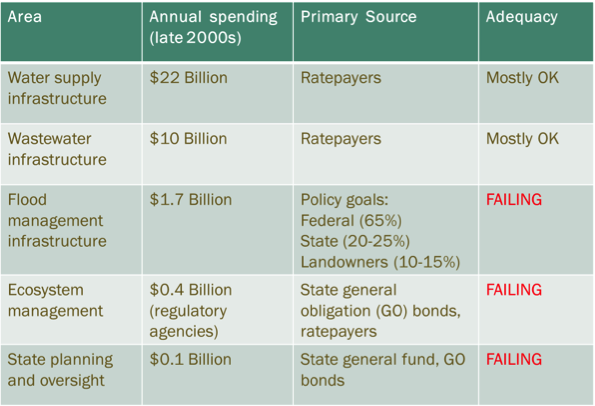 This brings me to the key issues that the legislature will need to grapple with going forward regarding water sector funding: What are the appropriate roles for state GO bonds? And what other types of funding should the state encourage? 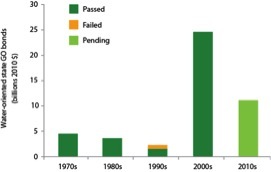 As Figure 4 (below) highlights, state GO bond support to the water sector increased significantly in the 2000s – in real terms, nearly $25 billion was approved in the past decade to support a variety of activities – two and a half times more than the entire amount approved in the preceding three decades. These funds have supported many valuable efforts, and they have been vital for flood protection and ecosystem management activities. But as noted, bond funding can be less reliable as a funding source: witness the period during the recent recession when bond sales – and the activities they were supporting – were suspended. And the Legislature’s decision to twice postpone placing the most recently proposed $11 billion bond on the ballot (SBx7-2, approved by the legislature in late 2009 as part of a broader water package) reflects signs that voters may have lost their appetite for these measures, which ultimately require their approval as well. Figure 4. Growth in state GO bonds for water in the 2000s was unprecedented. Source: Hanak et al. 2012. Water and the California Economy. PPIC. State GO bonds are certainly welcome budgetary supplements to water sector managers. But they also require tradeoffs with other important activities the state supports – such as education and health and social services – because they are paid back through general fund tax dollars. What’s more, the availability of bond funds to support activities that water users could readily pay for themselves can weaken the incentives to make sound management decisions at the local level. It is therefore important to consider both the total amount of state water bonds and the areas where they are especially helpful to improving statewide water management. Does the funding generate broad public benefits? Areas like ecosystem enhancement fall into this category, for instance the funds anticipated for Delta ecosystem enhancement in SB x7-2. Does the funding support public health and safety? This would include addressing environmental justice concerns of providing safe drinking water in communities that can’t afford it. It would also include helping to fill the federal gap in flood protection spending, given the likely difficulties of raising all the needed funds locally. Does the funding leverage “good behavior” on the part of local water managers? Arguably some of the most useful programs funded by bonds in the past decade have been designed in this way – encouraging more cooperative approaches for groundwater management and integrated water resources management. (i) Public goods or benefit surcharge. There has been much talk in recent years of this alternative from the playbook of California’s energy sector – a surcharge levied on ratepayers to support activities that help the sector to support more environmentally sustainable goals. Such surcharges actually already exist in the water sector in some parts of the state – notably the Metropolitan Water District of Southern California’s surcharge on water sales, used to support local projects that enhance water supply reliability, or the Sonoma County Water Agency’s surcharge to support recovery of endangered fish species within its watershed. (ii) Special mitigation fees. Other sectors also use revenues from surcharges on the sale of certain products to pay for related environmental mitigation. For instance, we pay an electronic waste disposal fee when we buy computing equipment, and we pay a fee to mitigate lead paint poisoning when we purchase paint. One relevant source of support for programs to clean up drinking water is a fee on the sale of nitrogen-based fertilizers. Since the passage of Proposition 26 in November 2010, these types of fees now generally require a two-thirds vote by the legislature or a supermajority vote of the general public within local agencies. (iii) Set-asides of other state revenues. A small share of transportation funds might appropriately support the work of the state Department of Fish and Wildlife, given the major effects of roads on aquatic ecosystems. As a precedent, 0.1 cent per gallon of federal gas tax funds a Leaking Underground Storage Tank Trust Fund. (iv) Regional and local flood fees. Given the funding gaps in flood protection, more funds will likely be needed from local assessments. In some cases, it will make sense to scale this up to the regional level. A regional flood authority for the Delta – called for in the new Delta Plan – is a proposal in this direction. Developing a range of funding options is likely to put California in the best position to meet the challenges of sustainable water management in support of a strong 21st century economy, society, and environment. See PPIC’s 2012 report, Water and the California Economy, by Ellen Hanak, Jay Lund, Barton “Buzz” Thompson, W. Bowman Cutter, Brian Gray, David Houston, Richard Howitt, Katrina Jessoe, Gary Libecap, Josué Medellín-Azuara, Sheila Olmstead, Daniel Sumner, David Sunding, Brian Thomas, and Robert Wilkinson. See also Chapter 2 of PPIC’s 2011 report, Managing California’s Water, From Conflict to Reconciliation, by Ellen Hanak, Jay Lund, Ariel Dinar, Brian Gray, Richard Howitt, Jeffrey Mount, Peter Moyle, and Barton “Buzz” Thompson. Much of this analysis is summarized in Hanak. 2012. “Adequate and Appropriate Funding for a Modern Water Sector: Insights from California.” Water Resources Committee Newsletter 14(3), August, Section of Environment, Energy, and Resources, American Bar Association. The U.S. Environmental Protection Agency compiles this needs assessment every four years by surveying all local and regional agencies. This entry was posted in Uncategorized and tagged California water, California's water sector, Ellen Hanak, water bond. Bookmark the permalink.